I got a ticket for running a red light (7th and Folsom) 30 days ago. Today was my last day to "appear" in court. I showed up, waited in line and found out that the officer who busted me hadn't yet filed the ticket or something like that, so there's no record of my infraction in the system. Yes, some assholes will give people on bicycles tickets for running red lights when there are no cars around. I'm still not sure how much this will cost me. I hope I don't have to go to traffic school. That would be heinous. 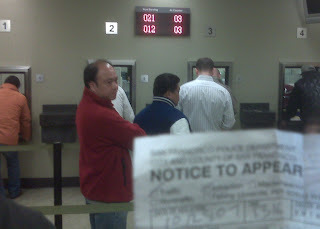 Hopefully the ticket will not appear in the system ever and I will not have to appear at 850 Bryant again. ya, I got popped doing 140mph driving up from LA and as far as I can tell, the dude never turned the ticket in. It's been 2 years... you might be off the hook.